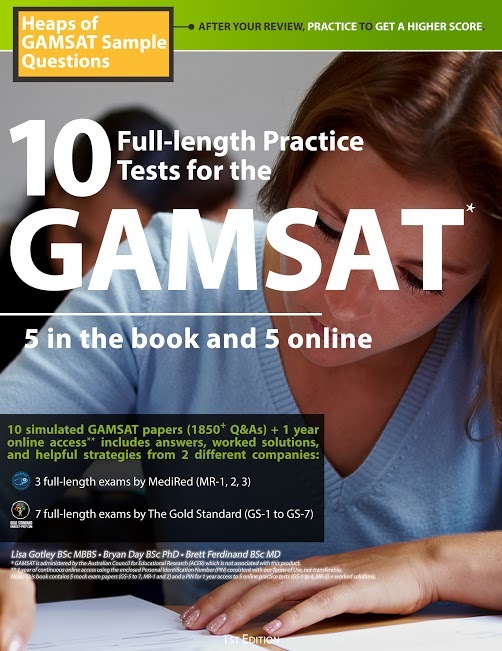 1st GAMSAT Textbook, Ever: Completely Revised! GAMSAT Textbook 2013 International Books Award Winner! Although this policy may seem long, we have prepared a detailed policy because we believe you should know as much as possible about our practices so that you can make an informed decision. The privacy practices of this notice apply to the website located at http://www.gamsat-prep.com (collectively the "Site") and apply generally to our international parent, its subsidiaries and joint venture partners' websites whose specific privacy policies are available from our Privacy Central pages. Our parent, our subsidiaries and joint venture partners operate under similar privacy practices and, subject to the requirements of applicable law and, in the case of Australia, the requirements of the Privacy Act 1988 (Cth), (as amended by the private sector provisions which came into effect on 21 December 2001) (the "Privacy Act"). Questions regarding this statement should be directed to Gamsat Prep by sending email to the Trust and Safety team. Also, you may wish to refer to the Office of the Federal Privacy Commissioner which may be contacted at the following site: http://www.privacy.gov.au for more information on the Privacy Act. 1. An Important Note About Children. Children (persons under the age of 18 years) are not eligible to use our services unsupervised and we ask that children do not submit any personal information to us. If you are under the age of 18 years, you can use this service only in conjunction with and under the supervision of your parents or guardians. Our primary purpose in collecting personal information is to provide you with a smooth, efficient, safer and customized trading experience. This allows us to provide services and features that most likely meet your needs, and to customize our services to make your experience safer and easier. We only collect personal information about you that we consider necessary for this purpose and to achieve this goal. To fully use our services, you will need to register using our online registration form, where you will be required to provide us with your contact information and other personal information. Under some circumstances we may require some additional necessary financial information. We use your financial information, including credit card information to verify your name, address, and other contact information, as well as to bill you for your use of our services. We automatically track certain information about you based upon your behavior on our Site. We use this information to do internal research on our users' demographics, interests, and behavior to better understand and serve you and our community. This information is compiled and analyzed on an aggregated basis. This information may include the URL that you just came from (whether this URL is on our Site or not), which URL you next go to (whether this URL is on our Site or not), what browser you are using, and your IP address. We use data collection devices such as "cookies" on certain pages of our Site. "Cookies" are small files placed on your hard drive that assist us in providing customized services. We also offer certain features that are only available through the use of a "cookie". We also use "cookies" to allow you to enter your password less frequently during a session. Cookies can also help us provide information which is targeted to your interests. Cookies are stored on your hard drive, not on our Site. Most cookies are "session cookies," meaning that they are automatically deleted at the end of a session. You are always free to decline our cookies if your browser permits, although in that case you may not be able to use certain features on our Site and you may be required to reenter your password more frequently during a session. If you choose to buy on our Site, we collect information about your buying behavior. If you establish a credit account with us to pay the fees we charge, we collect some additional necessary information, including billing address, credit card number and credit card expiration date and tracking information from cheques or money orders. We use personal information about you (including but not limited to the information in the file we maintain about you, and other information we obtain from your current and past activities on the Site) to resolve disputes, troubleshoot problems, help ensure safe trading on our Site. At times, we may look across multiple users to identify problems or resolve disputes, and in particular we may examine your information to identify users using multiple User IDs or aliases. You agree that we may use personal information about you to improve our marketing and promotional efforts, to analyze site usage, to improve our content and product offerings and customize our Site's content, layout, and services. These uses improve our Site and better tailor it to meet your needs, so as to provide you with a smooth, efficient, safer and customized experience while using our services. Advertisers. We aggregate (gather up data across all user accounts) personal information and disclose such information in a non-personally identifiable manner to advertisers and other third parties for marketing and promotional purposes. However, in these situations, we do not disclose to these entities any information that could be used to identify you personally. Certain information, such as your name, email address, password, credit card number, and bank account number, are never disclosed to advertisers. Legal Requests. Gamsat Prep may lawfully disclose your personal information for law enforcement or regulatory purposes. Gamsat Prep cooperates with law enforcement inquires and other third parties to enforce laws, intellectual property and other rights. We can (and you authorise us to) disclose any information about you to law enforcement or other governmental officials as we, in our sole discretion, believe necessary, appropriate or as otherwise permitted under the Privacy Act 1988 (Cth), in connection with an investigation of fraud, intellectual property infringements, piracy or other activity that is illegal or may expose us to legal liability. Further, we can (and by becoming an Gamsat Prep member you authorize us to) disclose your UserID, name, street address, city, state, post code, country, phone number, email and company to Gamsat Prep Verified Rights Owner Programme participants as we, in our sole discretion, believe necessary or appropriate, in connection with an investigation of fraud, intellectual property infringement, piracy or other activity that may expose us to legal liability or as otherwise permitted under the Privacy Act 1988 (Cth). Your User ID and email address. If you change your User ID we keep track of your old User ID(s) and your new User ID. Your registration information such as: name, address, city, state, post code, country, primary phone number, secondary phone number, fax number and gender. Your password (if you have supplied such information).. Your credit card number, expiration date, and other financial information. You must promptly update your personal information if it changes. Upon your request, we will deactivate your account, contact information, and financial information from our active databases. To make this request, email the Trust and Safety team. Such information will be deactivated as soon as reasonably possible in accordance with our deactivation policy and applicable law. We will retain in our files information you have requested to remove in some circumstances, such as to prevent fraud, resolve disputes, troubleshoot problems, assist with any investigations, and to comply with legal requirements. Further, such prior information is never completely removed from our databases due to technical constraints and the fact that we back up our systems. Therefore, you should not expect that all of your personal information will be completely removed from our databases in response to your requests. However, such information will be deactivated from public viewing and will only be available to select Gamsat Prep personnel. If you have any questions, please contact Customer Support. Currently our locations for Live GAMSAT Courses: Brisbane, Sydney, Melbourne, Adelaide and Perth in Australia; Dublin in Ireland; and London in the UK. The Only Prep You Need TM, The Gold Standard, GAMSAT University Online Course (test prep) and The GAMSAT Preparation Bookstore may be either trademarks/service marks or registered trademarks/service marks of RuveneCo Inc. To see our YouTube video regarding our Medical College Admissions Test materials, click here: MCAT.